Sarah Wise, 2017-2018 Women’s Philanthropy Chair at the Jewish Federation of Cincinnati, at the International Lion of Judah Conference. While there she was honored with the prestigious Kipnis-Wilson/Friedland Award. 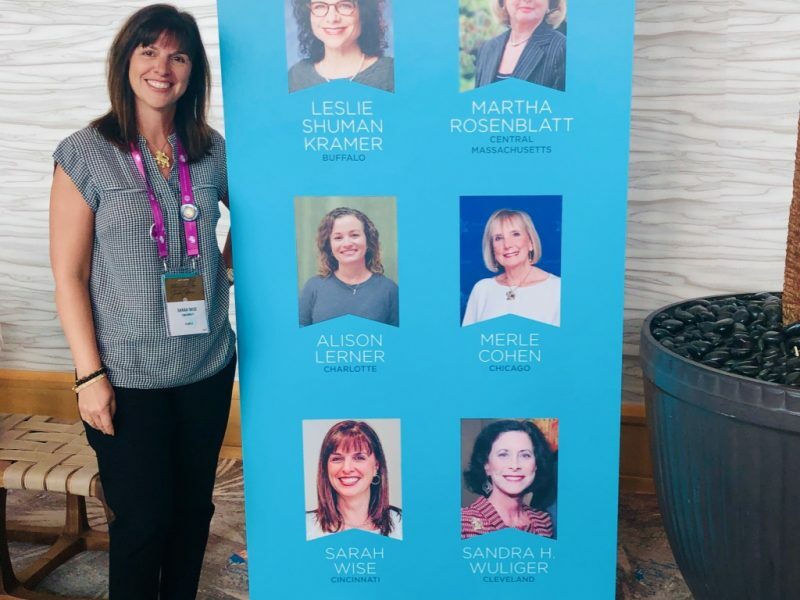 Sarah Wise of Cincinnati was honored by the Jewish Federations of North America’s National Women’s Philanthropy with its prestigious Kipnis-Wilson/Friedland Award. The award was given at the 2019 International Lion of Judah Conference, which was held in Hollywood, Florida, January 13 to 15. The Lion of Judah Society’s goal is to play an essential role in creating social justice, healing the sick, feeding the hungry, preserving human dignity, and building Jewish identity. The award honors Lions of Judah who have demonstrated the highest ideals of leadership and involvement. “She is passionate about repairing the world, and her actions demonstrate her efforts to do just that, one good deed at a time,” said Jennifer Zelkind, Director of Women’s Philanthropy at the Jewish Federation of Cincinnati. Wise has supported Women’s Philanthropy in Cincinnati for over 15 years, becoming a Lion of Judah in 2007. During her tenure in leadership with Women’s Philanthropy, Wise has made her mark by focusing women of all ages and giving levels on mitzvot. This year alone she was instrumental in helping some of the most vulnerable in our community, including helping pack 130 Thanksgiving meals at the Jewish Family Service Heldman Family Food Pantry in the Barbash Family Vital Support Center.